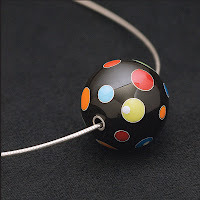 I smiled when I saw Tammy Kirks’ Red Bee website with “pop art” influenced enamels. And I love her concept of “modern granulation”. I think my favorite profiles are with designers who made jewelry design a second career…just like me. 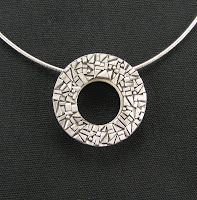 I took a granulation workshop with Doug Harling about five years ago and loved the technique, but didn’t like the final look. It was too fussy for my taste. Once I started researching artists who do granulation I found some work of John Paul Miller’s from the late 1960s-early 1970s. He was using chips of metal to create a different look and I loved it. Now most of my granulation pattern ideas come from stonework from the mid-century, architecture by Frank Lloyd Wright and geometric patterns. I’m getting most of my enamel ideas from the 1960s and 70s. I love patterns by Pucci, Marimekko, Vernor Panton and other designers from that era. I’ve always been drawn to pop art so I guess it carries over into my work. The most challenging is creating production work because it’s what sells. I’d rather devote my time to creating artistic pieces, but the production lines are my bread and butter. I enjoy granulation the most because I do each piece for myself. I make what I like and hope someone else likes it too. I’ve had to raise my prices and I don’t work with as much gold as I’d like. I created a gorgeous 22K granulated ring this past January but I can’t afford to make another one right now. I wear the one I made so people can see my work in gold and it’s a good advertising piece for me. Word of mouth. I’m terrible at marketing myself! I worked at an advertising agency for five years and am great at promoting others, but I’d rather spend my time in the studio than marketing my work. Just do it! Find your voice and follow it. There are so many designers out there that it’s easy to compare yourself to others and get discouraged, but there’s room for everyone. Take as many classes and workshops as you can so you can learn as much about metal as possible. You don’t have to do every technique you learn, but it’s good to experiment. I try to take at least one class and one workshop a year. 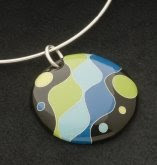 Tammy’s work can be found at boutiques throughout Missouri and Tennessee. 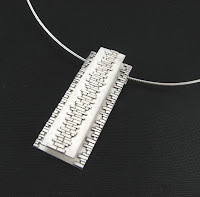 Previous post: Alice Sprintzen: Amazing Found Object Art Jewelry!